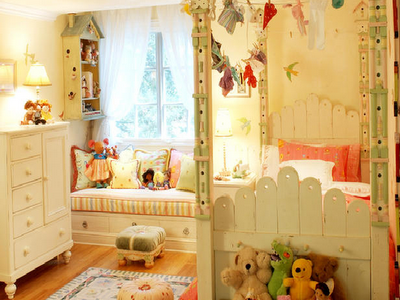 I just can't help but share here this girl's room design by featured designer Linda Applewhite. I'm sure every Mommy out there would love to have this design for their little girl. I especially love the bed design which is so cute and whimsical. Those little stools are adorable. That storage bench adorned with some colorful throw pillows added color to this magical room. And how about that fancy bird house in the corner? Don't you find it a perfect way to showcase those colorful books? Really love this design and the color combination is just awesome! That's indeed magical and pretty room Sis. The color and decor that they used are so neat. Thank you for sharing it with us. :) By the way sabay pumindot na rin ako dito hehehe. This is so adorable for a little princess.